Witness spellbinding sorcery, astonishing experiments and hilarious theatrics this Easter at Alnwick Castle. Experience an exciting array of activities from mischievous medieval alchemy and craft-making at the Artisans Market, to exceptional displays of English falconry and side-splitting entertainment from our resident Jester. Between the 6th and 10th April, come experience fun-filled family entertainment with Peterkin the Jester’s hilarious blend of medieval comedy, magic and occasional mischief. Whether wobbling precariously on wooden stilts, close shaves with his fire-eating antics or balancing upside down on any fool he can trick into lying on the floor, Peterkin will have you thoroughly amused! Put on your most enchanting robes and experience a comical performance like no other with characters likened to those from the magical world of Harry Potter. 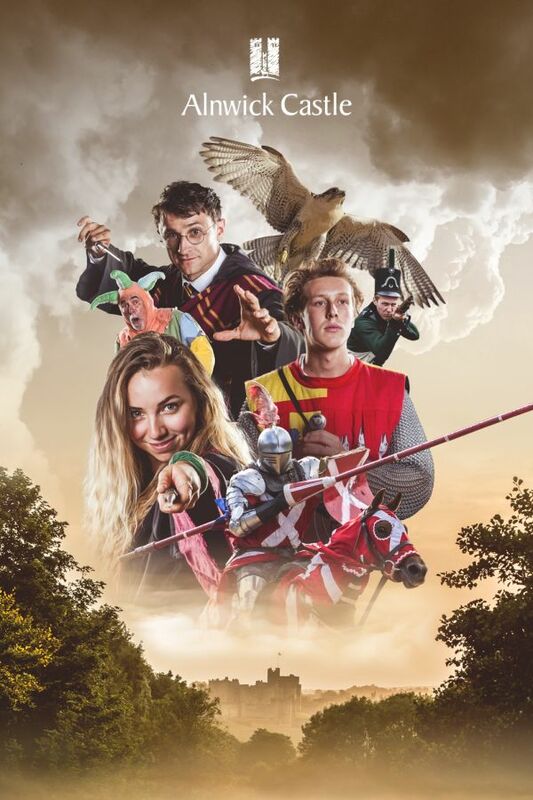 Inspired by the film productions which have graced Alnwick Castle, Potter Inspired Characters presents a wonderful performance of mesmerising magic and slapstick comedy between the 13th and 16th April. Observe an exceptional display of medieval falconry combined with enchanting storytelling and inspiring history, sure to thrill the whole family! Watch in awe as these spectacular birds of prey swoop, soar and glide from rampart to roof, whilst discovering more about why hunting with birds became established in the Middle Ages – held between the 13th and 17th April. Try your hand at medieval craft, pottery or tile-making and see if you have what it takes to be a medieval artisan. Held between the 19th and 22nd April, Company of Artisans showcase how arts & crafts developed in the medieval period as well as exploring the skilful nature of stonemasonery through informative demonstrations. On the 19th until the 22nd April, listen to the joyous tones of medieval melodies and traditional songs performed by Trouvere Minstrels. They are even known on occasion to teach nearby young peasants how to play their amazing array of medieval style instruments! Watch in awe at Dr Greene’s magnificent alchemy experiments; from grand explosions to deadly potions and icky materials, this medieval sorcery is bound to cast a spell on you! Catch this whacky madman between the 19th and 22nd April. Activities listed are free with admission. Please note, activities listed do not always occur on the same day.